As we passed the makeshift market, I asked the vendor – a Vietnamese man sporting an army green outfit, hat and long beard – where he acquired the items. “We use metal detector in the jungles,” he said, while cradling a colorful collection of North Vietnamese awards in the palm of his hand. “This for a big battle here in Hué in 1968 in Tet (the Chinese New Year). All soldier get this,” he said, while pointing out a metal pin-like object. It bore the colorful silhouette of a North Vietnamese soldier, crouched on the ground below the same red and gold flag that is so ubiquitous on Vietnamese streets today. “That 100,000 dong ($5 USD),” he said. “But this Ho Chi Minh medal 200,000 dong,” he remarked, pointing to a faded and slowly rusting memento. 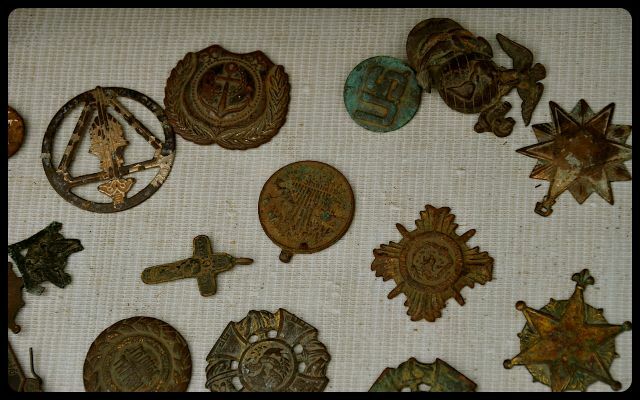 “And these French cross from French Indochina War,” he added. Under a row of oil paintings with horse, still life and landscape subjects, canteens and dishes for mealtime collected the occasional rain droplet. Some outer rusted shells showed their age and the weather they’ve had to endure in the decades since the Vietnam / “American” War. 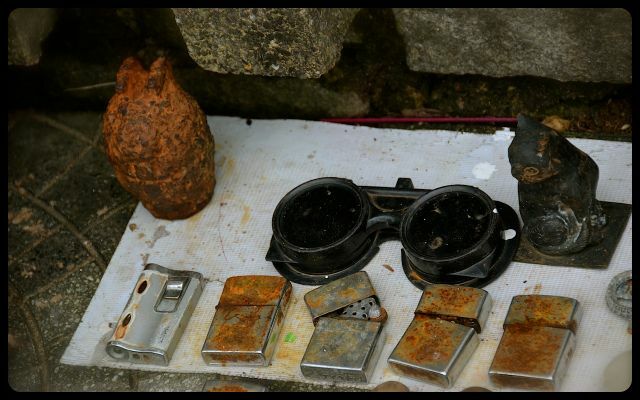 A rusted, unused grenade sat beside a figurine of a black cat, only separated by a pair of military goggles. 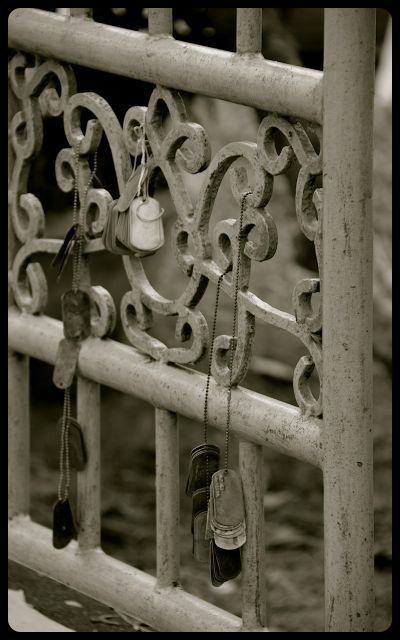 As I photographed the items for sale and strolled along the sidewalk, I pondered how the dog tags came to have been left in the jungle. Did the soldiers die? Would their loved ones back in the United States wish to have them now? Were they even authentic? 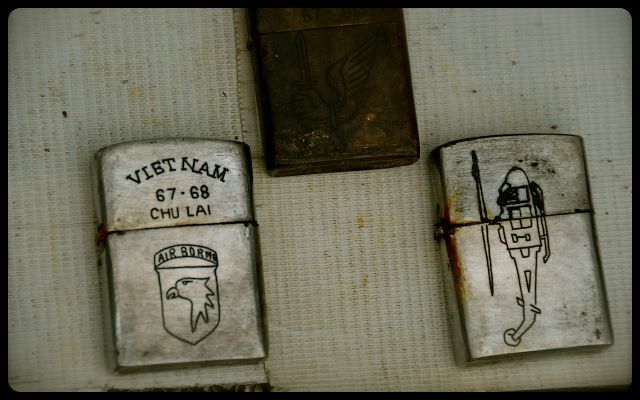 I thought it ironic that items representing previously warring factions could now be co-mingled into such a peaceful mélange: Buddhist icons and French crosses from the French Indochina War, American Airborne crests and North Vietnamese battle medals and American Zippo lighters. Perhaps this modern market’s mélange of mementoes was symbolic of Vietnam today – a North and South united and the Vietnamese treating us with kindness even when they learn that we are American. We did not purchase any items. 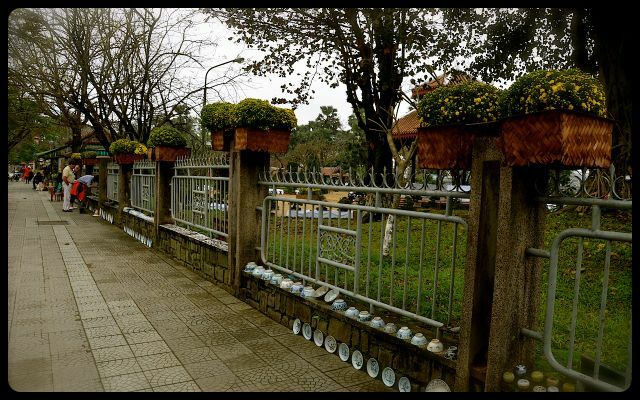 As we left the vicinity of the citadel market to return to our hotel on the other side of the Perfume River, I had a difficult time erasing the memory of the dog tags dangling on the crackling celadon-green painted railing. When I returned to our hotel, I began researching the status of these items, to try to ascertain if they were legitimate. 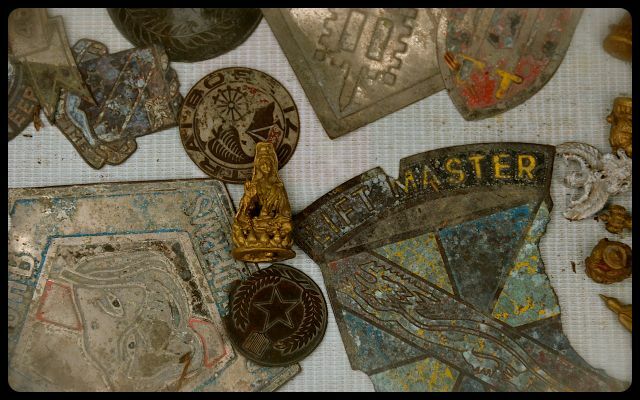 One article detailed the findings of an American forensic anthropologist who concluded that many of such items for sale in Vietnam were authentic. 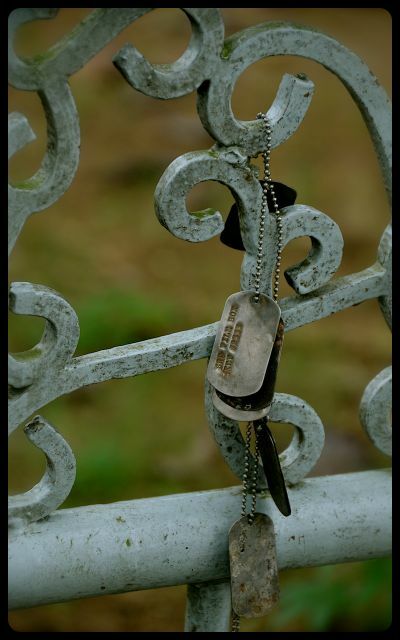 He concluded that the dog tags might have belonged to a service member who simply lost them, was killed in action or received medical treatment. 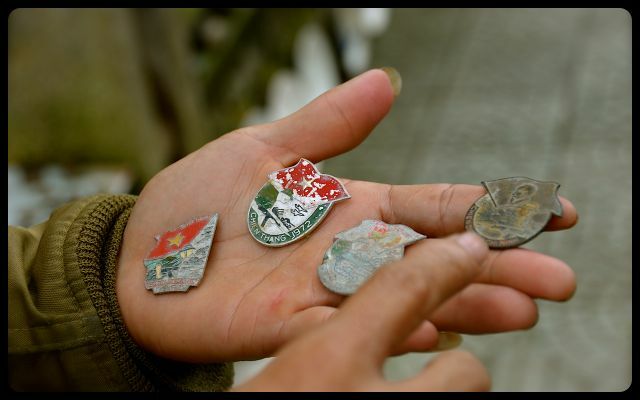 There are several organizations in the United States today that are working to reunite the dog tags that are sometimes found in Vietnamese markets, with former soldiers or remaining family members. Amazing. Can’t help but think of the owners of those items and how they lost these things and most probably their lives. Thanks for another fantastic post, Tricia. Jessie, it is haunting, isn’t it? After this particular day, we watched the film Full Metal Jacket back at our hotel. It was really hard to watch, but it illustrated the horrors that went on for all involved parties. A trip to this part of the world makes such a strong case against war. It’s sad to think the tags may have belonged to soldiers who died but I can’t help thinking how sad it is that people have to make a living by selling them. The Vietnam war is the one,in my mind that was one of the most brutal on the local population with so many unnecessary deaths – not to mention the high number of birth defects after the war because of the use of chemicals. Good blog, it makes you stop and think. Hello, Jane. I’m glad to see that this was a meaningful post for you and thank you for sharing your thoughts. Indeed, being in Vietnam was at times difficult for us personally because we are American. It was hard to see first-hand how people were impacted by American policies of past decades. In Ho Chi Minh in particular, we saw a fairly large number of amputees as well as people who were victims of Agent Orange (or perhaps they just had birth defects that could’ve been prevented had their mothers had access to appropriate medical care). Surprisingly, no one was unkind to us when they learned that we were American. I’ve now been well-received during two visits to Vietnam — first during a 2009 trip to Hanoi (in northern Vietnam) and most recently for the past three weeks (primarily in central and southern Vietnam). ha-ha! 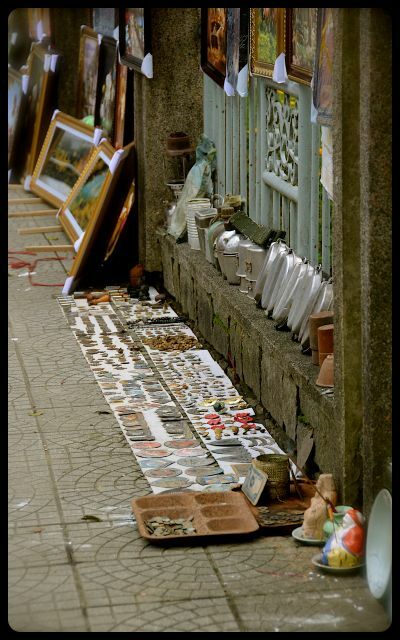 i had to laugh when i saw your photo-blog on dogtags & etc for sale by a HUE street vendor by the Perfume River. i wish you had included a photo of the vendor himself…..but i recognized him by his untrimmed grown-out fingernails (an asian affectation of one who does not do manual labor) as Crazy LOP. i followed you there by few months (JULY) and by the time i met LOP, he no longer had a ‘flowing beard’. It is possible it could have been his father….since (the father) ran the sidewalk concession few yards away….and even further down was another spot operated by his sister-in-law. LOP, along with his relatives, has been hustling that same sidewalk concession for 19 years (hence his fluency in english). Yes, Dr. Robert Mann (JPAC-CIL forensic anthropologist) was correct….the majority of the ID tags are legit. 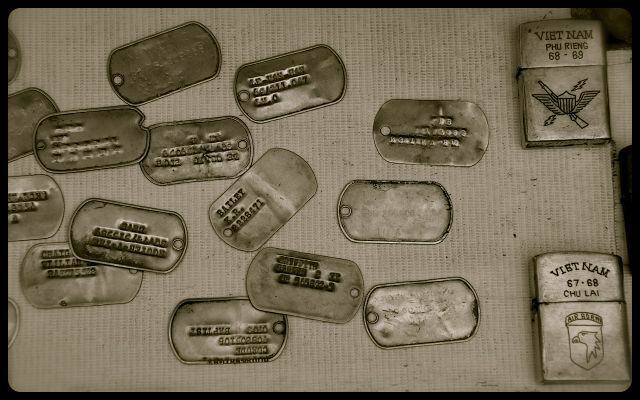 The only fakes LOP had were some reproduction blank dogtags. He did have several ‘unfinished’ tags…and or typo tags that were probably jettisoned in a trash pit (and later scavenged). Thank you for not buying any of them. 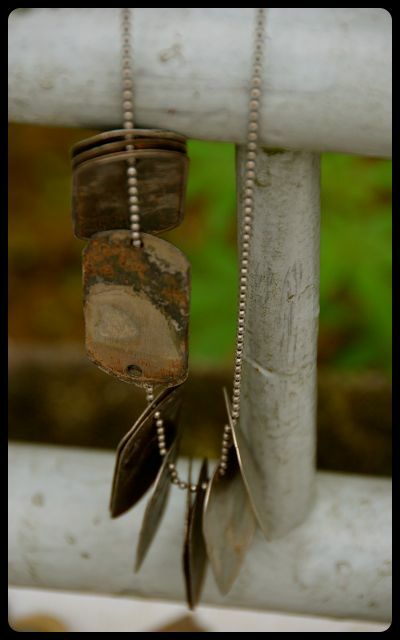 You left me two rare KIT CARSON SCOUT tags, the only viet tags i bought from him as I left plenty of ARVN tags behind. I bought over 150 USMC & US ARMY ID tags from LOP and his sister-in-law in 3-4 different ‘buys’, the USMC BRINKLEY tag depicted in your first image being one of them. LOP was asking an outrageous $10 (USD) per tag…and trust me, i had to hammer him hard to get the first 100 tags at $5 (USD) each. I later bought several more (after plying him with beers) at $4 (USD) each and by the time I left HUE, he was begging me to buy his remaining tags at $3 (USD) per with the condition (LOP ever the street hustler) that i had to get a minimum of 20 tags (which i regrettably did not have time to do). Good old LOP initially thought i was his gravy train as he told me of a Vietnam Veteran two years ago, who bought 100 of his tags at $8 USD each. I quickly dispelled that notion (i.e., not his manna from heaven) by showing him JPEG images on my digital camera of $3 tag buys at the DAN SINH MARKET (SAIGON) and what really squashed his hopes, pics of a local metal detector (one of his sources) with the mounds of tags i bought (cheap!). Yes, i also fondled the same black cat figurine (in one of your pics) but fortunately missed the ‘unused’ rusted grenade (hopefully tossed in the perfume river) as unexploded ordnance can be quite dicey. The souvenir trinket shops across the Perfume River on Le Loi Street were also asking $10 each on their tags, but did not have very many for sale and i was able to skim-off the better ones for $5-$6 each. Only a very few of these HUE tags were verified KIA via research on the ‘virtual Wall’. BTW-i like your pensive musings on the War and resulting artifacts but watching FULL METAL JACKET in your hotel room will not give you an understanding what happened in HUE during TET 1968. The movie is Hollywood and better yet, Kubrick filmed it in London at a housing project that was being razed. If you’re that interested, do yourself a favor and read FIRE IN THE STREETS (Eric Hammel) and or BATTLE FOR HUE (keith nolan). Thanks for the memories. Hello Tamba, and thank you for sharing your experience about your visit to Hué! What a small world it is; it’s funny that you recognized the scene and vendor (at least his hand) immediately. 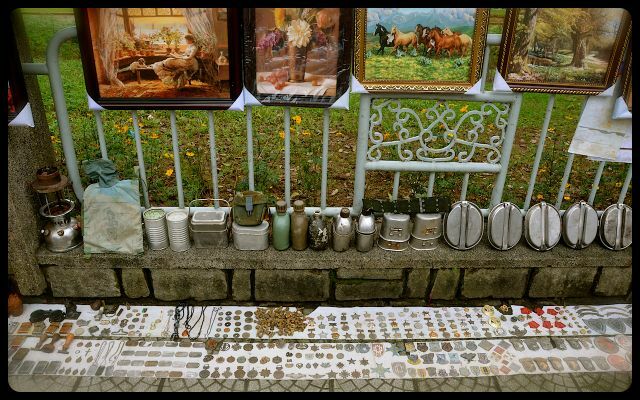 I was really interested to learn more background information about the vendor, his family and all the artifacts. We enjoyed our time in Hué – particularly the Imperial City and imperial tombs. Since my husband and I are both history buffs, I also appreciated your recommendations to read Fire in the Streets and Battle for Hué. 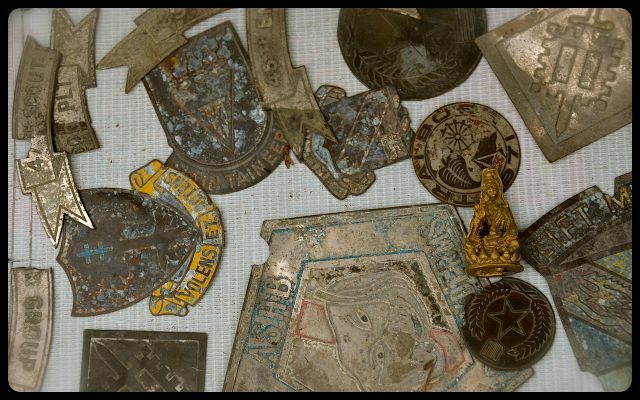 I’m curious – are the artifacts you purchased for your personal collection, or a museum? 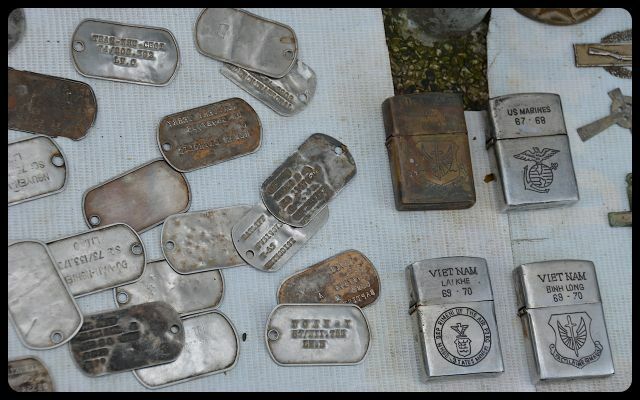 much like Dr. Rob’t Mann (whom i’ve been in contact with via e-mail) i was more or less the point-man for certain dog tag collectors here in the US, doing investigative research on the tags and tag market in VN. Most of my tag ‘buys’ were conducted in Saigon, Hue and Danang. i did discover certain tag ‘migration’ meaning USMC & SSDC tags which most certainly are indigenous to the I CORPS DMZ areas were found (and bought) in Saigon City. A few of the locals (sellers, collectors and etc) have told me, it (migration) occurs because of the heavier tourist traffic and trade in Saigon. Hence logically batches of tags found in the DMZ area would perhaps find their way south. i have not of yet discovered if the reverse is true (I suppose not since most of the heavy fighting was done in Central VN esp I & II CORPS areas lending to a higher plethora of locally ‘discovered’ tags). i have not finished fully researching the over 1,000 tags i brought back from the NAM so cannot make any definite conclusions other than what i related in my initial comments/reactions to your HUE blog. However, much like Dr. Mann, I could not locate a Vietnam war vintage surplus US ADDRESSOGRAPH stamping machine in-country….so it would be safe to say the quality reproductions have not fortunately made an appearance. 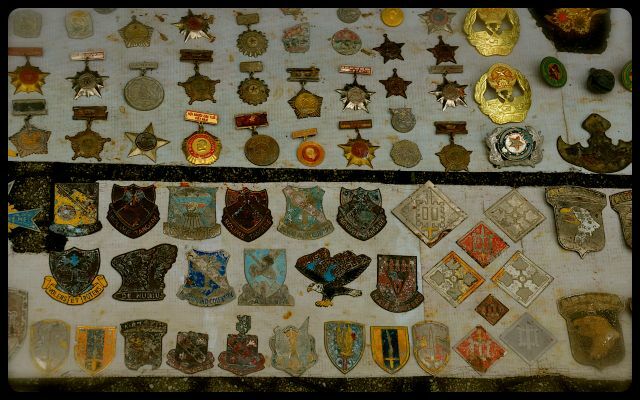 To answer your Q, the tags were purchased mainly for a quantitative research study (outside of a museum) of US tags found in present day VN. Latest price for the tags is VND400,000 each, which equates to about $US20.00 each,as they are becoming scarcer at the markets. I bought 14 for VND 3,100,000 (about $US 136.00) as a bulk buy,and am now trying to find owners/families. Not much luck so far, but here’s hoping. I can then focus on the 19 US GI Helmets from WWII,that I found in Papua New Guinea, and try to track down those owners/families, if this succeeds. Hello Rick, belated thanks for your comment! I apologize for my delayed reply, but your response had gotten lost in my spam comments. 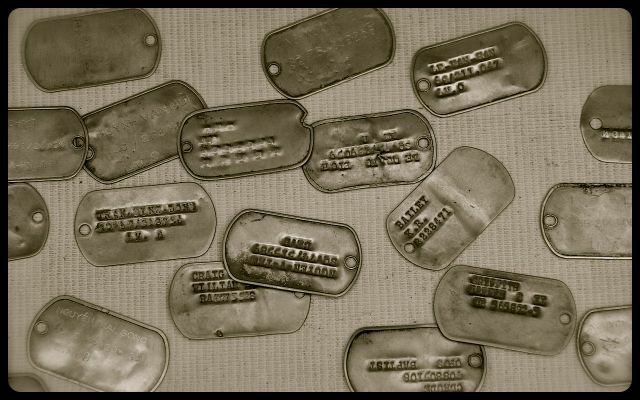 It’s interesting to read that you’re trying to track the owners and/or families who are connected to these dog tags. 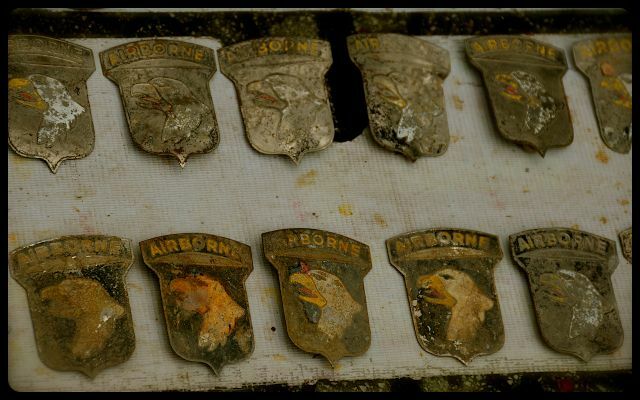 When we were in Vietnam, we wondered if the dog tags were authentic. Your experience of having successfully reunited them with two people seems to indicate that many of them likely are. As for organizations to get in touch with, I wish I could point you in the right direction. I now see that the website I referenced in this post back in 2012, is no longer active. Do you know if these are legitimate websites/projects? Perhaps you’ve already reached out to them? I wish you continued success with your venture! It’s a thoughtful gesture. Thanks for the heads up with those sites Tricia. I hadn’t heard of them but I will certainly give them some time now, in the hopes it might help me get these tags home where they belong. Rick, I’m happy to pass them along. It would be interesting to hear how you track down the owners and families. Do you hunt for leads via a Google search? Or, sometimes use social media? It’s noble detective work, either way!